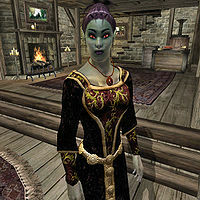 Lady Drad, a Dunmer noble, is the wife of Lord Drad, who owns an estate north of Anvil. It seems that Lord Drad is not opposed to using slave labor to line his pockets, especially in Bleak Mine, which he owns. Malacath, however, does not look kindly upon this particular endeavor. If you express abolitionist tendencies when talking to Lord Drad, have a chat with Lady Drad; she has a surprisingly different mindset. Disgusted by the slavery in Bleak Mine but in love with the upper-class life, Lady Drad certainly appreciates the money the ogres bring to the house and stays inside all day long, enjoying a relaxed existence. After waking up at 6am she picks a random book from the nearby collection and studies it until 8am. The rest of the day is spent wandering around the ground floor, only interrupted by a two-hour breakfast at 2pm and a two-hour dinner at 6pm. At 10pm, she heads upstairs and goes to bed. After the ogres have been set free from slavery, Lady Drad will, alongside her now-enslaved husband, be forced to work the land outside the house, 24 hours a day, without ever eating or sleeping. She wears a black & burgundy outfit with a pair of green velvet shoes, a silver ruby ring, and a different leveled piece of jewelry. She also carries a rake which she will use once she has become a slave, a green silk garment, and a small amount of gold. When she is forced into slavery, she dons a lower-class outfit consisting of a pair of coarse linen pants, a coarse linen shirt, and a pair of oiled linen shoes. Speaking to Lady Drad before you start Malacath's task she will greet you with, "Greetings, traveller. What is your business here?" Asking her about the Lord Drad Estates will have her reply, "Drad purchased the land and title from Council. It cost him a fortune, and he's determined to make it pay." Asking her about her husband will have her say, "He is my husband, a kind and gentle man. He has given me everything I might ever desire." If you got into an argument with Lord Drad by claiming that slavery is immoral she will greet you with, "I'm afraid you've upset my husband. Please, leave before he loses his temper. I beg you." Speaking to her about the ogre slaves will have her reply in two possible ways, depending on what you say to Lord Drad. If you either do not speak to Lord Drad about the ogres or show no empathy towards the slaves she will say, "I can't tell you about that. Please, just go." if you anger Lord Drad by claiming that slavery is immoral she will show her abolitionist attitude (or at least some empathy towards the slaves) by saying, "He works them in Bleak Mine. It's terrible. The guards beat the creatures mercilessly. That's all I can tell you. Now please, go." If you murder the ogres she will be angry with you: "You've murdered the poor beasts! And ruined us! Leave us alone!" Speaking to her after you have freed the ogres will have her say, "Now my poor husband is the slave, and the ogres are his masters. They haven't harmed us, but he's never worked so hard in his life." before immediately ending the conversation. This page was last modified on 27 February 2014, at 00:20.